It’s midnight. I should go to bed. But there’s something nagging at me, and it’s keeping me from calling it a night. I shuffle down the stairs, open the refrigerator door and peer into a leftover rice bowl from Shouk. The container of cauliflower, asparagus, arugula, za’atar, and tahini would make for a satisfying lunch the next day. I hesitate before removing it from the shelf. I can’t resist. I grab the bowl and a plastic fork, and devour every last morsel. 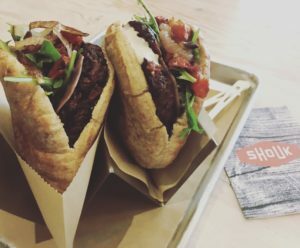 Shouk, a fast casual restaurant that is 100% plant-based, has ignited my passion in a way that I’m powerless to resist. Nussbacher is a vegan who grew up in Israel. Friedman has worked with legendary chefs Michel Richard and Daniel Bouloud. Its a good time for Shouk, as Israeli food is rising in popularity with restaurants like Shaya in New Orleans and Zahav in Philadelphia gaining national recognition. Shouk has already achieved accolades in its first year. It was recognized by Eater DC in 2016 as the Fast Casual Restaurant of the Year. Don’t come to Shouk expecting falafel. It’s not on the menu. What you get instead are tantalizing fusions of vegetables that are stuffed into pita or tossed into a salad. The combinations are delightful- even to the most ardent carnivores. I vacillate between ordering a lentil bowl with fennel, potato, red pepper, and pistachio pesto or a pita filled with black beans, sweet potato, red pepper, tomato, arugula, and a toss of spicy harissa. As I take my turn at the counter, I shift gears, settling on a bowl of lentils with cauliflower (the very same one that makes a brief appearance in my fridge), a Shouk burger, and sweet potato fries with cashew labneh. The Shouk burger is a revelation, made from 15 vegetables. including chickpeas, black beans, scallions, mushrooms, and beets. Flaxseed serves as a binder. The patty is crisped on a griddle and served in a pita brimming with add-ons including roasted tomatoes, pickled turnip, arugula, charred onion, and tahini. Each bite offers unique flavors and sensations alternating between chewy, crunchy, creamy, slippery, and spicy. Veggie burger skeptics- hold your horses. This is a must try burger, particularly during May, which just happens to be National Burger Month. 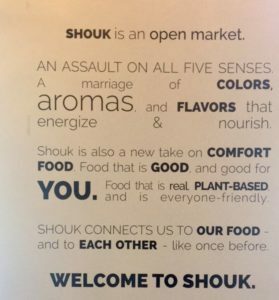 As more chefs realize the benefit of focusing attention on vegetables, Shouk leads the way with its singular dedication. 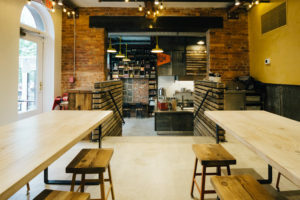 Shouk’s appeal extends to the interior decor, with rustic wood tables and benches, and walls that alternate between brick and bright yellow. 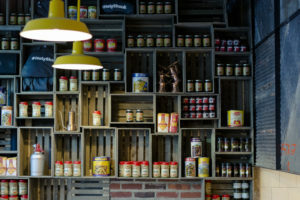 One wall features a panoply of words that are key to the Shouk concept- colors, flavors, comfort, aromas, everyone-friendly, and of course, plant-based. For those of us who have visited Israel, the background music serves to stir up fond memories, adding another layer to the experience. It’s now morning, and I slowly descend the stairs, desperate for my first cup of coffee. I open the refrigerator, and stare longingly at the blank space where my Shouk leftovers perched ever so briefly. I can only do one thing. I shake my head slowly, and plan my aliyah (return) back to Shouk.